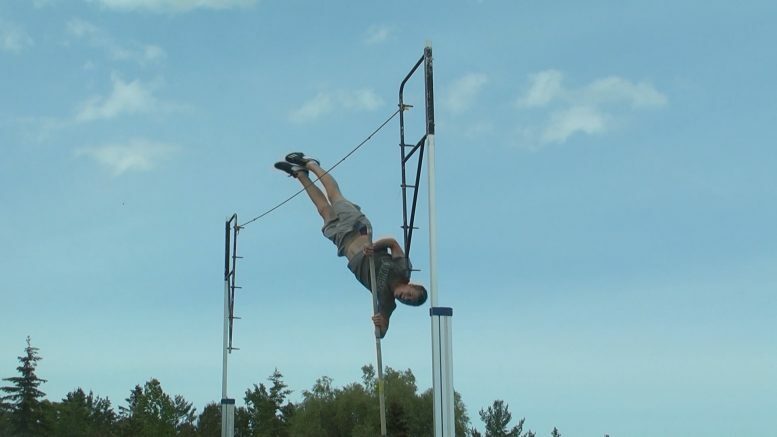 Sophomore Gabe Bullis practices pole vault in Alpena preparing for the Nationals Emerging Elite competition. Alpena Sophomore Gabe Bullis jumped 15′ at State to advance to the Nationals Emerging Elite division in pole vault. The Sophomore needed to clear a height of 14’8″ in order to qualify for this event. Bullis had jumped 14 or higher the past six meets leading to Michigan’s State Division 1 track meet. 15′ was a personal best. Joy Bullis is proud of her son who has put three years into pole vaulting. He keeps getting better and learns fast. Joy is one of the Alpena track coaches, but when it comes to Gabe and pole vault she watches from a parent’s perspective. Former Alpena pole vaulter Alec LeTourneau jumps for Grand Valley State and has brought back all of his knowledge for Gabe. LeTourneau believes that with determination and proper form, Gabe can get 15’6″ at Nationals. The Emerging Elite competition is June 15th, 2018 in Greensboro, North Carolina at Aggie Stadium.